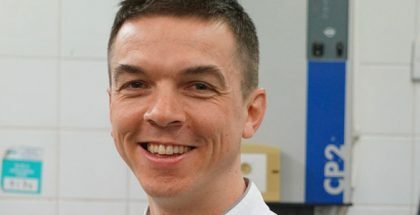 In my journey through Asia, I had a chance to talk to Richard Long, the Executive Pastry chef of The Ritz Carlton in Hong Kong, about his life and his professional career. 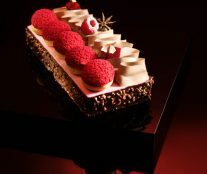 With extensive knowledge in the fine art of pastry, he has refined alluring desserts with his over 24 years of experience. The Malaysian-born chef started his pastry career in a local bakery in his hometown of Kuala Lumpur. 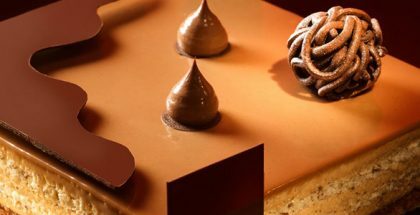 French and Japanese pastry techniques and inspiration made him go to culinary school in Malaysia where he developed a fascination with the art of chocolate and desserts from the moment he was in college. 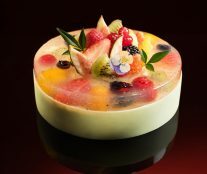 At his first job at the Regent Hotel, a Four Seasons Property in Singapore, he started as a pastry chef assistance under the tutelage of Kenny Gong, where he learned the art of pastry. 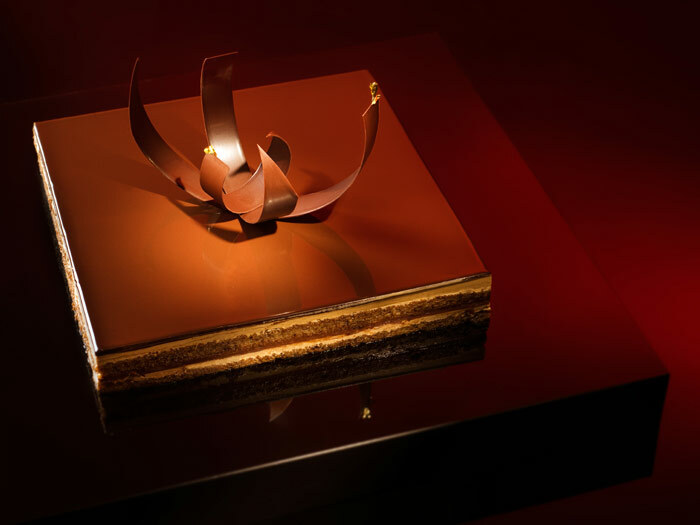 Soon after, he joined the Ritz Carlton Company as head pastry chef of The Ritz Carlton Hotel in Istanbul in 2000. 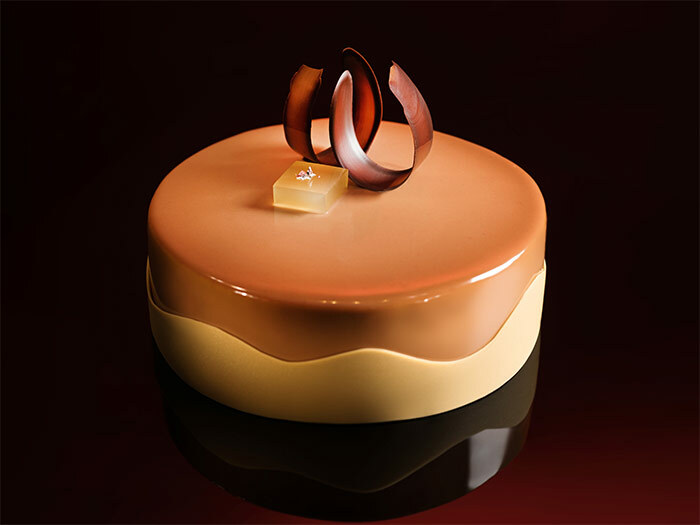 Chef Long travelled to Paris to perfect his pastry technics in Lenotre and worked for Pierre Herme’s shop in Paris. 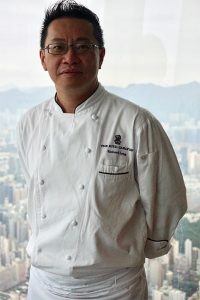 He moved back to Asia in 2003 to Hong Kong to work for the Ritz Carlton. 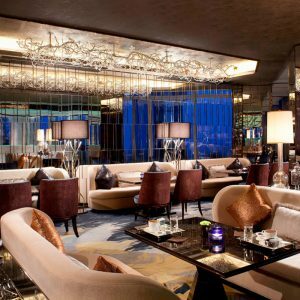 “I am honored and excited to work for The Ritz Carlton. It has been the longest hotel company that I have worked for, simply because it is one of the best companies in the world. They allow you to continue to grow”, Long said. 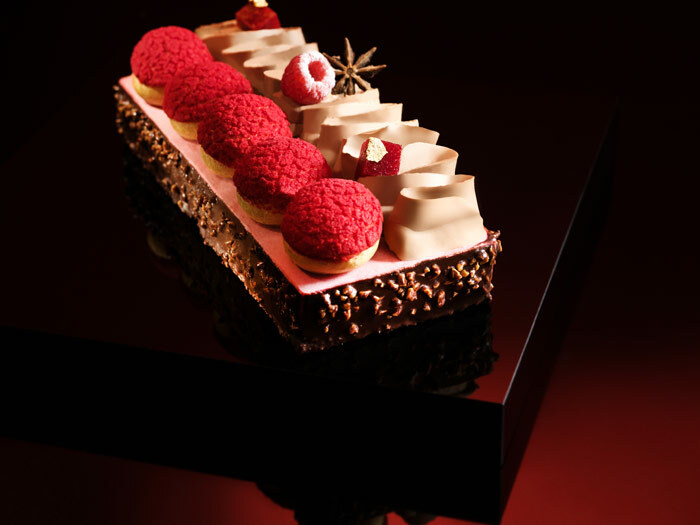 How do you see the Pastry World in Asia? What will the next big trend be? The trend is always innovation, things that are new! People want to see something new all the time. In my case I always stick to texture, temperature, design, good ingredients, and techniques. In Asia we don’t have a reputation for pastry, we have chefs from France, Switzerland, and Germany, for example, who pastry cooks learn from to carry out daily work. They usually lead the culinary force, we learn the technique from them, and we use that to create desserts, especially in China where you have so many ingredients to play with. It is very easy to come up with great flavors and desserts. 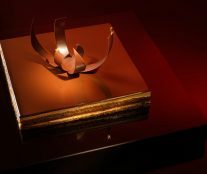 Who do you think is going to lead the next Asia pastry champion? Japan is leading the pastry scene in Asia but watch out for China. 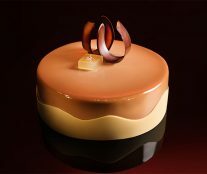 Now they have a National Pastry Team which is going to the Coupe du Monde de la Pâtisserie. Singapore and Malaysia are very strong competitors too. China is quickly catching up to the other countries in the pastry scene. What is the most important thing for you when it comes to creating a new dessert, and where do you find the inspiration to create? People like a show, so we use liquid nitrogen, or other molecular tricks! We always look at what is happening around us. I go to the market and discover the best products for our desserts, for instance I love ginger with everything, citron pepper, mangos, chocolate. I love things that are refreshing. I make a cucumber honey sorbet that I sous vide and the flavor is amazing! How do you fuse Chinese traditional pastries to modern pastry? This is not an easy task. Chinese cuisine has existed for thousands of years and some of the traditional ways of baking and cooking are never going to change or else the product won’t ever be the same. I play with the ingredients. Let’s say sweet red bean soup is very traditional, and I used the red bean with coconut and I created a cake that is a fake dessert because it looks like red bean soup but it’s a cake and people get surprised and they love it! Where do you want to take your career and your future? I have successfully opened Istanbul, Tokyo, Singapore, Shanghai, Hong Kong, Ritz Carlton Properties. With my experience I feel I can contribute to train the company’s future pastry chefs. 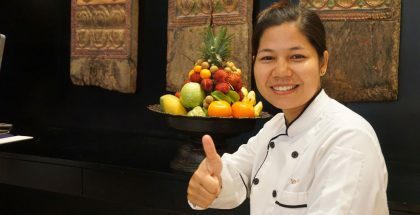 I would like to take my career to the next level and become a Regional Pastry Chef overlooking and visiting the other properties throughout Asia. The hardest part of the job and the most important is consistency, that is the mayor problem. We need the same thing every day, this is the most important thing as pastry chefs. How do you control the recipes in a global company or are they mixed and let chefs create? We have signature recipes that have to be followed, but chefs are free to create and do research and development as well as a good budget to spend. Of course, there are company standards since our chefs come from different parts of the world, as well as each city culture is different in our properties, having a local identity of their own in breathtaking locations. The high elite clientele who stay with us expect the best service and food, it’s like a home away from home. The bar high and that’s why we have to follow hotel standards and regulations. I respect classic French pastries. 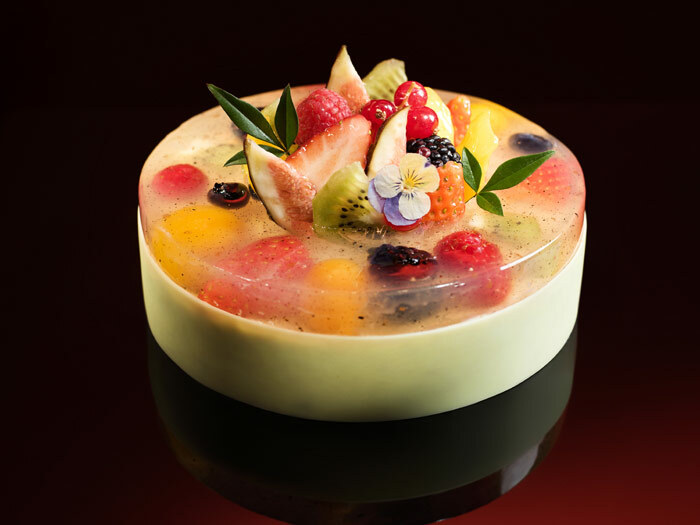 However, I will inject my own personality and play around with the style and flavor of classic French pastries in creative and exciting ways. Guests can expect chocolate creations with a local touch like milk tea and egg-tart flavor. Fiona Wong, Director of marketing communications: Opened in 2011, 7 restaurants, 490 meters above sea level, highest bar: Ozone bar. 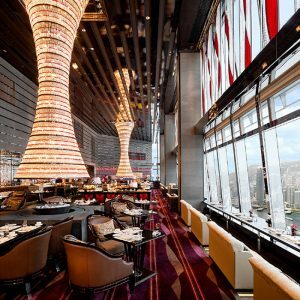 Occupying floors 102 to 118 of the International commerce centre in Kowloon, it is one of the highest hotels in the world. It has the highest swimming pool in the world. The hotel has 312 guest rooms, all offering spectacular city and harbor views. With seven dining venues including the state of the art Michelin starred Italian restaurant and two Michelin star Chinese restaurant.